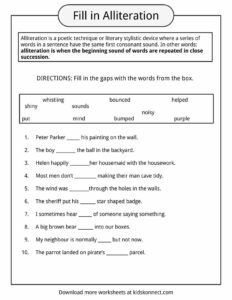 Alliteration is focused on the sound of a word and not the letters in the word. So for example, “k” and “c” could both be used alliteratively (cherry cookies in the kitchen). Words do not need to be directly next to each other in the sentence to be alliteration. This is often the case but filler words like “the” and “in” are regularly used. There is no specific rule about how many words spacing their should be between the repeating sounds in an alliterative piece of text, but a good rule of thumb is when the text is read out loud. If you can’t detect that there is a repetition of sounds then it might be considered alliterative. Apart from tongue twisters like “She sells sea-shells down the sea-shore”, alliteration examples can be found in poems, song lyrics and even popular business or brand names. All Adam ate in August was apples and almonds. Barry bought a book to bring to the backyard barbecue. Come and clean your closet, Kevin. David’s dog drunk dirty water down by the dam. Even elephants enjoy eating eggs every day. My friend foolishly forgot to take the first photo in France. The gentle giant jumped with joy. Hopefully Harry’s home will have heat soon. Ian was interested in eating ice cream. Jane juggled jack o’lanterns in the gym. The candy killed Katie’s cavity. Looks like lions love licking lizards. Mike’s mother makes a mouthwatering mince pie. Noreen knew she was natural at kneading noodle dough. On paper, owls outperform ostriches. Peter Piper picked a peck of picked peppers. The Queen quietly and quickly made a quip about quilts. Rudolph the red-nosed reindeer rose rapidly to the roof. She sells sea-shells on the sea shore. Timmy the tattle-tale tried to tell tall tales to the teacher. My uneducated uncle never understood how to use umbrellas. The ventriloquist varied his voice very well. We walked while wondering where Wally was. The xenophobes were zooming and in the zone. Yvonne yelled that yoga was your yin to her yang. Zack the zoo-keeper read his zodiac zealously. Alliteration is very important in poetry and prose and can be used to make poems and text more interesting, attractive, and memorable. 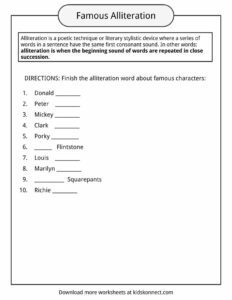 Why not try to practice by writing and speaking out loud your own alliteration examples? 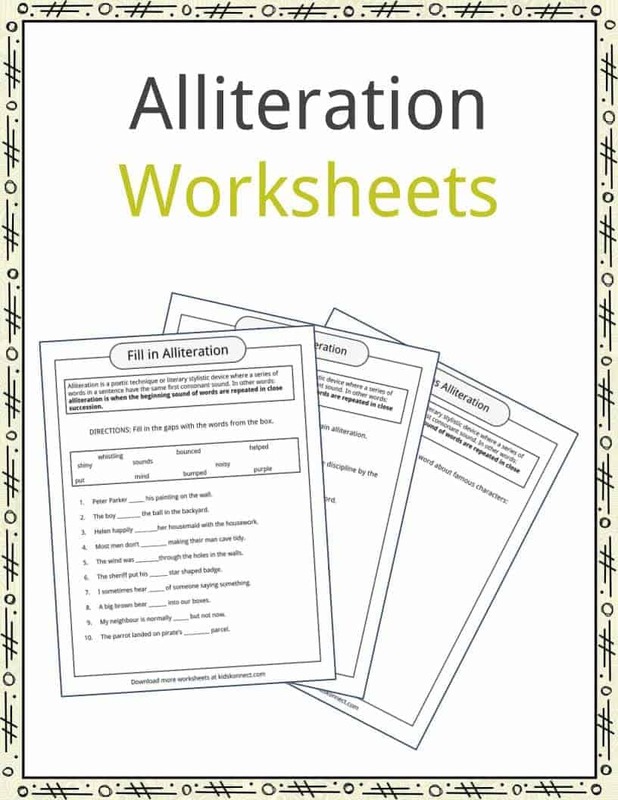 This bundle contains 5 ready-to-use alliteration worksheets that are perfect to test student knowledge and understanding of what alliteration is and how it can be used. 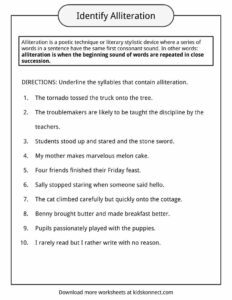 You can use these alliteration worksheets in the classroom with students, or with home schooled children as well.